Early afternoon we finally saw a group with good bulls. We stalked and crawled closer trying to head them off, only to have them change direction and head up a shallow valley, probably heading for water over the rise. Quietly backtracking until we were a safe distance away I smiled at Dianne â€œready to run?â€ I asked. To get ahead we had to backtrack over a hill and then try to get in front of them before they reached the head of the valley, a distance for them of 800 yards and probably 2 kilometers for us. We literally ran over the hill keeping well within cover and around behind the crest of the hill, spooking some zebra which thankfully moved away without undue fuss. It was a race against time as the sun began to sink fast on the horizon. As we crested the skyline and crawled towards a lone Acacia tortillis tree, I could see the Gemsbuck feeding diagonally towards us. The wind was almost perfect and we were looking almost directly into the setting sun. We hid behind the tree which had low branches allowing for a perfect rest. About 250 yards out the Gemsbuck turned and slowly headed away from us feeding as they went. Disappointment had yet again settled over us heavier than a lead blanket, we had hunted hard. Then inexplicably one bull turned and started feeding directly towards us. The glare made it impossible to see him properly. Would he be a good trophy? The setting sun showered the African savannah with a golden glow. 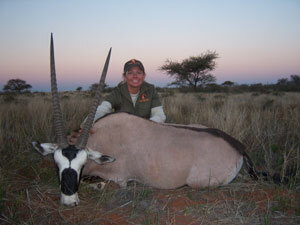 The gemsbuck was still 200 yards out when he showed himself. He was a good bull, an old mature male with thick heavy bases and long symmetrical horns, a bull that was past his breeding prime. Slowly he came, Dianne battling the glare of the setting sun on the horizon directly behind the gemsbuck. On he came until he was directly behind a tree 160 yards away, it was now or never. Then incredulously he saw us, head up staring trying to make out what we were half hidden in the Acacia tree, but it was too late, on the signal Dianne made good with a frontal shot that entered his chest and obliterated the plumbing on top of the heart. A quick insurance shot and he was down. It was difficult to contain our excitement as we admired Dianneâ€™s trophy, a beautiful bull, his teeth already worn down level to his gums, a worthy trophy hunted hard. My heart pounded loudly, my breathing already fast with sweat pouring down my back as we lay punctured by thorns, dirty and deadstill in the hot dry African sun. Gemsbuck, two of them, 40 yards away and still oblivious of our presence. The gemsbuck moved closer, alternatively feeding heads down with their horns sticking out above their shoulders (a good indication of a superior trophy) before walking towards the next edible grazing area, always alert. Long black horns, easily 40 inches in length, sweeping like twin rapiers through the air as they ever alert surveyed the territory ahead with huge dark eyes that compete well with Leica Geovid binoculars (with built in range finders keeping you just out of range). They wondered closer, 25 yards, then 20, 15â€¦., my grip tightened on my trusty .375 H&H, we were well within their â€fight zoneâ€, the space which any animal often chooses to fight and not flee when threatened and those horns were long and sharp, glistening in the late afternoon sun. Diane lay motionless slightly behind me, clutching her .30-06 ready to spring into action. Aristocrats, Knights of the Desert, Prince of the plains are a few of the more common descriptions which try to depict this noble animal, this time however we were looking at â€œprincessesâ€, their horns lacking the bulk of mature bulls. The wind swirled and with a snort and a cloud of dust they were gone. We unfolded our stiff limbs and continued with our search with renewed vigour from the rush such special encounters bring. We were on Day 2 of the hunt, my clients Ron and Dianne Raydon from Houston, Texas. 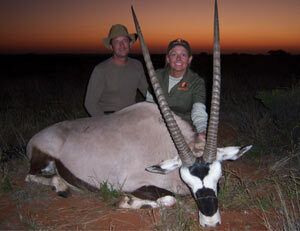 They were on their second hunting trip to South Africa, Dianne was looking to hunt a few good trophies with Kudu and Gemsbuck on the top of her wish list.